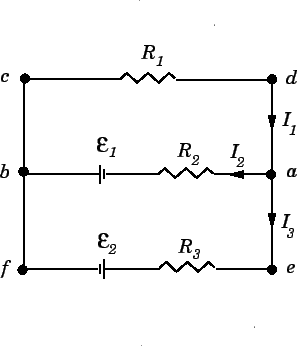 Question: Find the three currents , , and in the circuit shown in the diagram, where , , , V and V.
There is no need to apply the junction rule again at point , since if the above equation is satisfied then this rule is automatically satisfied at . There is no need to apply the loop rule to the full loop , since this loop is made up of loops and , and the loop rules for these two loops therefore already contain all of the information which would be obtained by applying the loop rule to . The fact that indicates that this current is of magnitude A, but flows in the opposite direction to that which we initially guessed. In fact, we can see that a current of A circulates in an anti-clockwise direction in the lower loop of the circuit, whereas zero current circulates in the upper loop.